Achieving Sustainability When a Project Ends: What is the Principal’s Role? This year CTL will complete the fifth and final year in the federal Striving Readers Research Project, one of eight such projects in the nation. For the 21schools in 7 districts, efforts to sustain the use of the school wide PD model, CTL’s Adolescent Literacy Model (ALM), and the infrastructure support of the school literacy coach and literacy leadership team will be crucial in continuing to ensure that students have sufficient literacy skills to master content at the middle and high school levels. Since CTL’s mentor coaches will no longer provide training and development for teachers, literacy coaches and literacy leadership team members, it will be up to each school to continue the emphasis on classroom pedagogy that engages and instructs students so that they are successful learners. The principal is critical to the sustainability of instructional improvement efforts. It is all too often the case that when a project ends, and along with it the funding and formal support, educational innovations fade and the school returns to its pre-project practices. With the principal’s focus on continuing instructional improvement, and specifically on implementing the teacher knowledge and strategies central to the project, the school can continue to move forward. Communicate clear expectations for teachers to continue implementing the research-based classroom practices promoted in the project. Explain that as the principal you will look for these practices during regular classroom observations and also as part of the formal performance evaluation process. Ask teachers to make visible evidence of continued student learning. Pictured above and below are samples of student work from East Jessamine High School posted in classrooms and hallways. As a principal, you will want to see that students are continuing to apply the learning strategies—in this case, content literacy—as a regular part of their classroom routines. Draw on your faculty to provide ongoing professional development for their colleagues, demonstrating in faculty meanings and internal PD sessions, how they have refined use of the project’s instructional strategies and with what results. Use your existing leadership team structure, including teacher leaders, to monitor ongoing implementation of project learning and achievement of project goals even though the formal training and coaching support have ended. Report regularly to the faculty the findings of the leadership team and what that means for goal setting, specific actions and evaluation of school efforts in the future. 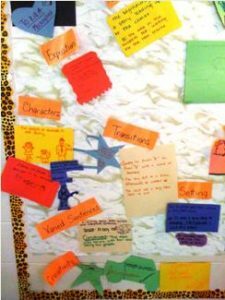 This entry was posted in Blog and tagged adolescent literacy, ALM, Instruction, leadership, research, Striving Readers. Bookmark the permalink.